Here’s another revitalized character design in the form of Mindsight. 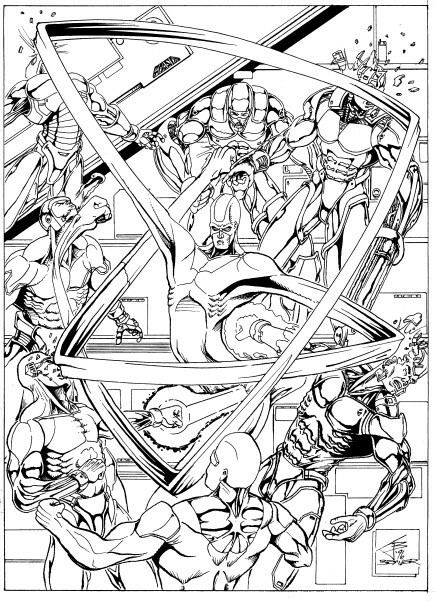 Mindsight here goes back to the early 90’s and is a member of my big ol’ group of superheroes that you’ll see soon. 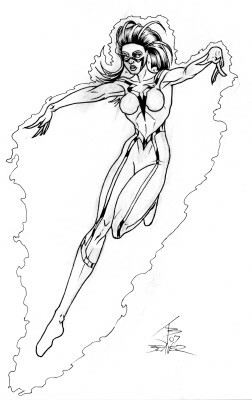 She has strong telekinesis powers, limited telepathy and other mental powers that she’s still in the process of developing. I started drawing this while mostly forgetting what her old outfit looked like. I figured I’d capture my favorite parts of the old outfit by habit while still feeling free to experiment a tiny bit. Then I dug out a pic of her and made a few more adjustments. Sure, it’s a mild outfit by most standards, but it fits her attitude. I’m hoping to have this one cleaned up and in flat color in time for a weekend Illmosis update. Back when I finally revealed the ScrollBoss 30K hits pic, I told people in a few places that I used to draw one character hitting lots of other people at once a lot. Hard to believe since I’ve mostly drawn solo pics since I had the artist’s block in 2002. But there’s your proof in the form of Longfellow (now known as Longway for now) punching six people at once. I finally found this and some other art from this period that I’m going to scan for various reasons. I also found the hand drawn video game logos from both that time and when I first started ScrollBoss. Many people borrow (as the kids put it) logos from there thinking that they’re all ripped from the games. I’ve even seen the custom Final Fight one show up in a fan game. It’s funny to have stuff that I did kinda float it’s way into other projects when I almost constantly bash everything that I make. I’m really liking that Longway picture. So much action going on at once and at a nice quality too. I’m Also really liking that character design too. Sad that I never took the time to look at this character before.